I gave this to my parents for their recent anniversary. 62 years – WOW! The second color stripe from the top was named “Orioles”. As in Baltimore Orioles (baseball team, for anyone not into American sports). PERFECT! My parents got married while my Dad was in the Air Force (stationed in New York, at the end of his stint). He got a weekend pass, came back home to Baltimore, they got married on Friday night, went to a Baltimore Orioles game on Saturday. Supplies: Stamp – Rubber Stampede, paper – Home Depot paint chip, Neenah Classic Crest Solar White, Stampin’ Up! Lovely Lilac (retired), ink – Hero Arts Unicorn, die – My Favorite Things, embossing powder – Filigree Fine Art Powder white. 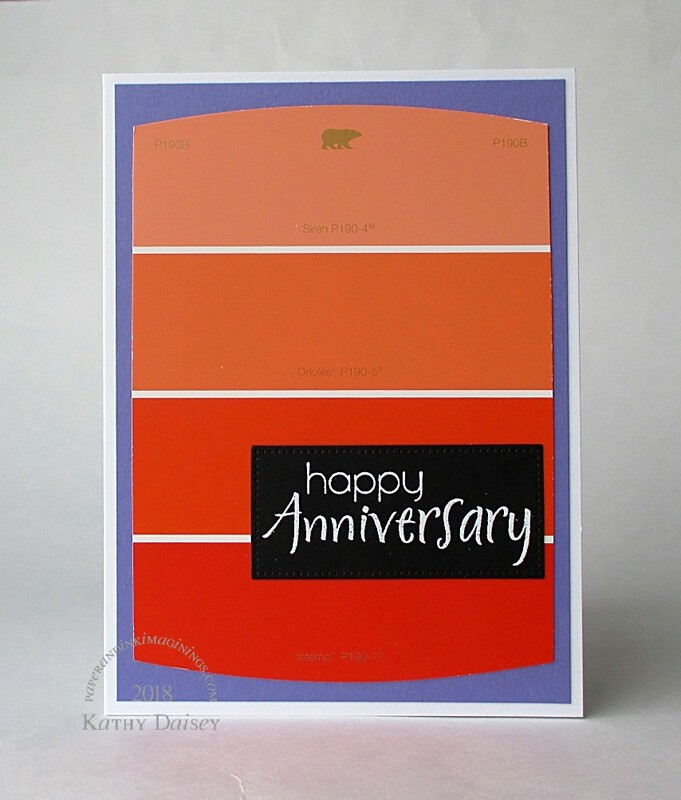 Categories: anniversary, card | Tags: card, Hero Arts, My Favorite Things, Neenah, paint chip, Rubber Stampede, Stampin' Up! | Permalink. 62 years is amazing. Congratulations to them. It is pretty amazing. Thanks for stopping by, Terry, you have been on my mind. Know I am thinking of you!